A day after he was killed aboard the USS Juniata, Lt. Wemple was buried in Beaufort, South Carolina. 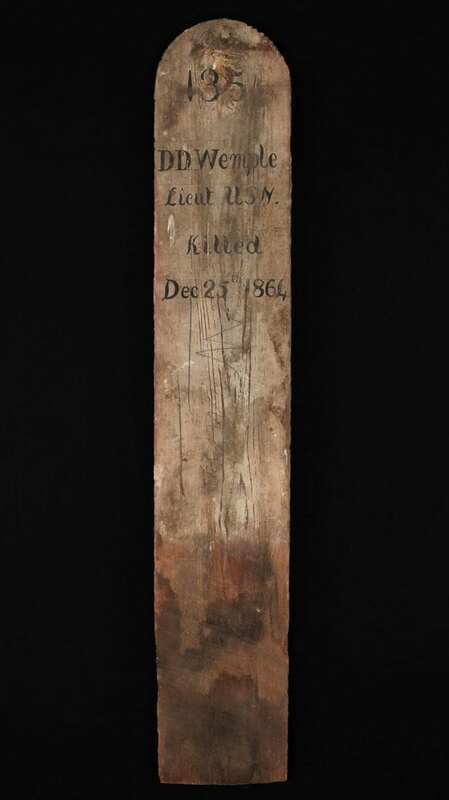 His temporary grave was identified by this simple wooden plank. At the start of the Civil War, Union forces were under the command of Winfield Scott. Scott, an old Army veteran, outlined a plan to defeat the southern states based upon the premise of a naval blockade of southern ports. Hoping to suffocate Southern trade, Scott’s plan was derisively referred to as the Anaconda Plan, by a skeptical Northern public. As this plan was being implemented, Wisconsin’s David Duane Wemple received an appointment to the U.S. Naval Academy. Upon graduation, Lieutenant Wemple received orders to serve aboard the USS Juniata; a steam powered Sloop of War. The Juniata first launched out of the Philadelphia Navy Yard on March 20, 1862, being commissioned there the following December. Commanded by John M. B. Glitz, the Juniata carried some eleven guns along with 160 officers and enlisted men. Scheduled for service in the West Indies, the Juniata joined the North Atlantic Blockading Squadron. Wilmington, North Carolina, was a major port of entry for imported goods from Europe. Supported by Fort Fisher, Wilmington developed into a stronghold for the Confederate navy and a hotbed of blockade running activity. Consequently, it became a target for Union naval and land forces. Wemple’s Juniata was ordered to the fight. On Christmas Day, 1864, during a naval barrage, one of the Juniata’s 100 lb. Parrot Rifle’s exploded, killing Lt. Wemple and several other crew members. The following day, he was buried in Beaufort, North Carolina. Wemple’s body was later removed to Wisconsin. This temporary grave marker accompanied his remains as he returned to his home state. Today, Lt. Wemple’s body rests within Emerald Grove Cemetery, Rock County, Wisconsin, and is a reminder of the sacrifices of those who served in a naval capacity during the Civil War.